Fort Rucker is a U.S. Army post located primarily in Dale County, Alabama, United States. It was named for a Civil War officer, Confederate General Edmund Rucker. The post is the primary flight training installation for U.S. Army Aviators and is home to the United States Army Aviation Center of Excellence (USAACE) and the United States Army Aviation Museum. Small sections of the post also lie in Coffee, Geneva, and Houston counties. 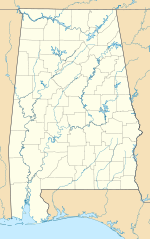 Part of the Dale County section of the base is a census-designated place; its population was 4,636 at the 2010 census. 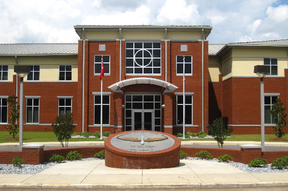 The U.S. Army Aviation Center of Excellence is the dominant military facility at Fort Rucker. Training, doctrine, and testing are all key parts of the Center's mission to develop Army Aviation's capabilities. All Army Aviation training has been undertaken at Fort Rucker since 1973, as well as training of US Air Force and ally helicopter pilots and air crew. The Center is home to the US Army Aviation Technical Test Center (ATTC), which conducts developmental aircraft testing for Army Aviation. The United States Army Operational Test and Evaluation Command's Test and Evaluation Coordination Office and TH-67 primary and instrument training are both located at Cairns Army Airfield. Operational units on the post include the 1st Aviation Brigade and the 110th Aviation Brigade handling Army Aviation training, and the USAF 23d Flying Training Squadron for the training of Air Force helicopter pilots and air crew. Support and other facilities at Fort Rucker include the Lyster Army Health Clinic, United States Army Aeromedical Research Lab, United States Army School of Aviation Medicine, United States Army Combat Readiness/Safety Center and Army Aviation Museum. The original name of the post was Ozark Triangular Division Camp, but before the camp was officially opened on 1 May 1942, the War Department named it Camp Rucker. The post was named in honor of Colonel Edmund W. Rucker, a Civil War Confederate officer, who was given the honorary title of "General," and who became an industrial leader in Birmingham after the war. Fort Rucker (situated on 58,000 acres (235 km2) of sub-marginal farmland, and formerly a wildlife refuge) was opened on 1 May 1942 as "Camp Rucker", and had quarters for 3,280 Officers and 39,461 Enlisted Personnel. In September 1942, 1,259 additional acres south of Daleville were acquired for the construction of an airfield to support the training camp. It was known as Ozark Army Airfield until January 1959, when the name was changed to Cairns Army Airfield. The first troops to train at Camp Rucker were those of the 81st Infantry Division; the 81st Division left Rucker for action in the Pacific Theater in March 1943. Three other infantry divisions received training at Camp Rucker during the Second World War—the 35th, the 98th, and the 66th. The 66th (Panther) Division left for the European Theater in October 1944. At the end of the war, the 91st and 94th Infantry Divisions were sent to Camp Rucker and deactivated. Camp Rucker was also used to train dozens of units of less than division size; these included tank, infantry replacement, and Women's Army Corps units. During the latter part of the Second World War, several hundred German and a few Italian prisoners-of-war were housed in stockades near the railroad east of the warehouse area, on the southern edge of the post. The 91st and 94th Infantry Divisions were sent to Camp Rucker at the end of the war and deactivated in December 1945 and January 1946, respectively. Fort Rucker is located at 31°20'37" north, 85°42'29" west (31.343654, -85.707995). On the base the population was spread out with 35.3% under the age of 18, 15.9% from 18 to 24, 46.2% from 25 to 44, 2.4% from 45 to 64, and 0.1% who were 65 years of age or older. The median age was 24 years. For every 100 females, there were 131.6 males. For every 100 females age 18 and over, there were 145.1 males. Mayte Garcia, dancer and singer, ex-wife of Prince. Al Gore, former Vice President of the United States, spent time as an enlisted man assigned to Fort Rucker. ^ Brainard, Emily; Russell Sellers (19 August 2010). "Crutchfield assumes command of USAACE, Fort Rucker". Army.mil. Retrieved 13 December 2010. ^ "Ech Stagefield Ahp HELIPORT Facility (11AL)". airport-facilities.findthedata.org. Retrieved 20 March 2012. ^ "The Aviation Technical Test Center". army.mil. Retrieved 5 April 2018. ^ "Information about Cairns Army Airfield". armyfleetsupport.com. Retrieved 5 April 2018. ^ Pike, John. "Cairns Army Airfield". www.globalsecurity.org. Retrieved 5 April 2018. ^ "Reference to summary of 23d Flying Training Squadron activities at Fort Rucker". militarymediainc.com. Retrieved 5 April 2018. ^ "Describes duties of The 1st Battalion, 11th Aviation Regiment". militarymediainc.com. Retrieved 5 April 2018. ^ "List of Aviation Regiments". militarymediainc.com. Retrieved 5 April 2018. ^ "Activities of each Aviation Regiment". militarymediainc.com. Retrieved 5 April 2018. ^ "Homepage for 1st Battalion, 223d Aviation Regiment". army.mil. Retrieved 5 April 2018. ^ "National Guard". nationalguard.com. Retrieved 5 April 2018. ^ "Welcome to Mother Rucker". Motherrucker.com. 10 June 2003. Retrieved 8 March 2012. ^ "US Army Aeromedical Center". army.mil. Retrieved 5 April 2018. ^ "U.S. Army Aeromedical Research Laboratory". army.mil. Retrieved 5 April 2018. ^ "United States Army School of Aviation Medicine". army.mil. Retrieved 5 April 2018. ^ "Pentagon won't rename Alabama's Ft. Rucker, named after Confederate officer - Yellowhammer News - Yellowhammer News". yellowhammernews.com. Retrieved 5 April 2018. ^ Stanton, Shelby L. (1984). Order of Battle: U.S. Army World War II. Novato, California: Presidio Press. p. 602. ISBN 0-89141-195-X. ^ "U.S. Decennial Census". Census.gov. Archived from the original on 12 May 2015. Retrieved June 6, 2013. Wikimedia Commons has media related to Fort Rucker.